For some flights, you’ll spend more time in line at the airport than you will in the air. Checking your bags, going through security, then boarding at the gate (not to mention the idle time spent in the jet’s aisle while the people in front of you invariably stow their over-large rolling suitcases improperly in the overhead bins and then remember they have to get something from that bag). JetBlue is hoping that using facial recognition technology can speed up at least one portion of this process. The airline announced this morning that it will start testing a (hopefully) expedited boarding process on one route — Boston to Aruba — starting at some point in June. After passengers on this route get through the security checkpoint gauntlet, they’ll have the option of posing for a photo at a camera station that links up to the U.S. Customs and Border Protection computers to verify your face against any sort of passport or visa photo you’d have stored with the agency. If the CBP can identify you, you’ll be cleared to board the jet without having to whip out your boarding pass (which you always manage to put in the most difficult to reach pocket). “We hope to learn how we can further reduce friction points in the airport experience, with the boarding process being one of the hardest to solve,” says JetBlue executive VP Joanna Geraghty. 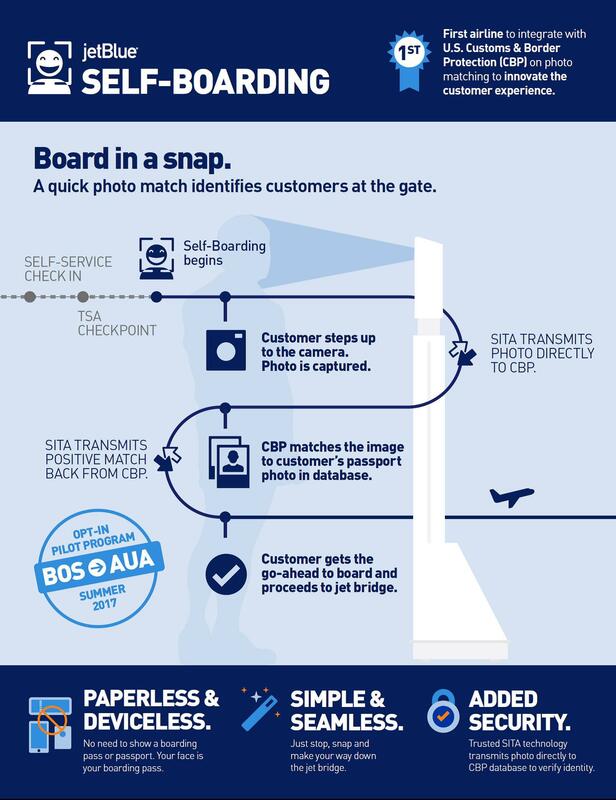 While JetBlue is touting this announcement as a first for a U.S. carrier, it’s not the first airline to use facial recognition to speed up boarding. British Airways launched a test of similar tech earlier this spring at Heathrow Airport in London. Meanwhile, Delta Air Lines recently spent $600,000 on self-service luggage check-in machines that use facial recognition at Minneapolis-St. Paul International.